If there's one thing I've learned over the years, it's that origami is the most stress-inducing activity I can do with elementary-aged students. Origami not only demands excellent fine-motor skills, it requires that students are accurate, creative, and patient. Sometimes kids get overwhelmed by the types of folds. Sometimes it's the number of steps or the language of the directions. 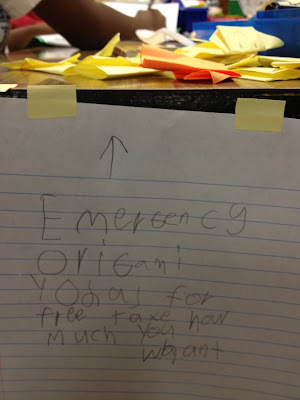 Either way, when our class finished reading The Strange Case of Origami Yoda, I knew I was in for trouble. After 30 minutes of "Is this right?" "How do I do that?" and "I can't do it," emotions in the room were running high. There were crumpled pieces of paper everywhere and I could tell tears were just around the corner. We took a deep breath, regrouped, and decided to table this activity for a homework choice. 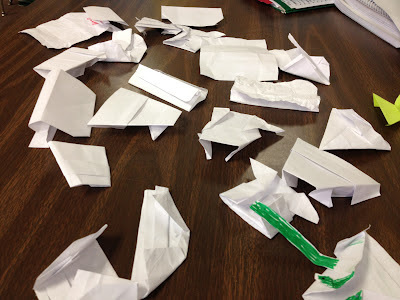 Depressed and defeated, we discussed how this activity relates to our lives as learners. We won't always get things right on the first try - FAIL is just our first attempt in learning. It's okay to get frustrated when you're doing something challenging. A break is not the same as giving up. If something is confusing, seek clarification. In assisting others we learn more ourselves. Directions help us to be self-sufficient. This conversation struck a chord with many of my students and I could feel the tension dissipate. As we left for the day, we held up our pathetic-looking Yodas high above our heads and proudly declared failure. Students left determined to try again, and to do better the next time. It was wonderful to see them excited and energized from their failures. I was proud of their maturity and hard work that afternoon given such a difficult task, but it was the following day when I overheard one student say to another during math, "That was a perfect fail - I'm so proud of you!" when I knew those 30 minutes of frustration were all worth it.